All	offices are located in William H. Gates Hall. to update information on this page, or for help with your student organization website. For more information on how to start or contact a student organization, contact the Student Bar Association. "Advocates for the Arts (AFTA) seeks to empower law students as informed and ethical future leaders in Washington's artistic communities. This means building awareness of our arts communities, learning how to serve the legal needs of artists and artistic organizations, including their intellectual property needs, and preparing students to be effective board members for arts organizations." The ACLU at UW works to advance the mission of The American Civil Liberties Union (ACLU) through education, leadership and activism. The ACLU is our nation's guardian of civil rights and liberties, working daily in courts, legislatures and communities to defend and preserve the individual rights and liberties guaranteed to all people in this country by the Constitution and laws of the United States. The American Constitution Society is a national organization whose mission is to bring together the country’s best legal minds to articulate a progressive vision of our Constitution and laws. The UW Law Chapter helps to nurture the next generation of progressive lawyers, judges, policy experts, legislators and academics by organizing platforms for debate and discussion about both enduring principles and the issues of the day, providing opportunities for networking, mentoring and organizing around matters of both local and national significance. The Federalist Society for Law and Public Policy Studies is a group of conservatives and libertarians interested in the current state of the legal order. It is founded on the principles that the state exists to preserve freedom, that the separation of governmental powers is central to our Constitution, and that it is emphatically the province and duty of the judiciary to say what the law is, not what it should be. Our chapter sponsors debates and speeches on campus to further the intellectual discussion of topics such as separation of governmental powers, the rule of law, and individual freedom and responsibility. The Food Law and Policy Association seeks to educate students and community members on legal issues affecting the global food supply, emphasizing local agriculture and regulation. Through educational advocacy and pro bono legal work, Food Law members will explore food safety and health, and the science and management of food systems. We will also tend to food justice issues such as public health challenges and environmental sustainability. The UW chapter of the National Lawyers Guild works to address the inequalities perpetuated by the legal system, guided by the belief that human rights must be regarded as more sacred than property rights. Members volunteer as legal observers at protests and court watchers at immigration proceedings, and they also provide support for SYLAW (Street Youth Legal Advocates of Washington) and the prison abolition movement. Members organize a mentoring program that matches progressive lawyers with law students and host speakers and workshops that offer critical perspectives on the law in support of community resistance. Through its activities, the Guild fosters a community of law students who are committed to using their legal education to promote justice, equity, and fairness. Student Animal Legal Defense Fund The SALDF, UW Chapter, is dedicated to providing a forum for education, advocacy, and scholarship aimed at protecting the lives and advancing the interests of animals through the legal system, and raising the profile of the field of animal law. The Student Health Law Organization (SHLO) concerns (1) the domestic and international laws and policies that affect access to quality and affordable health care; (2) the regulatory and ethical issues affecting modern health care entities and practitioners; and (3) connecting UW law students interested in health law with the Seattle health lawyers community. Throughout the year, the SHLO works to facilitate volunteer opportunities, speaker events, discussion groups, research projects, and social events for law students. The SHLO is supported by the UW Law School health law faculty and Garvey Schubert Barer and is affiliated with the Washington State Society of Health Attorneys (WSSHA), the American Health Lawyers Association, and Uplift International. By partnering with student organizations and providing skills in legislative advocacy, SOFA amplifies the voice of law students in the political process. Training activities will include exposure to community organizers, grass roots activists, and professional lobbyists. Students will use employ these skills to advocate for issues important to the UW Law community in Olympia, Seattle and beyond. The Technology Law Society works to bring the technology related legal resources of both the law school and surrounding community to the student body. The topics covered under technology are broad, including biotechnology, privacy, public interest, e-commerce and intellectual property. Sponsored events have included how to choose technology related classes, technology law reading groups and finding a job in the technology field. The Asian/Pacific American Law Student Association (APALSA) was formed with two major goals: 1) to organize, support, and promote the concerns of Asian and Pacific Islander minorities in the legal profession and 2) to increase ethnic diversity and awareness in the Law School and in the legal profession. All regularly enrolled students at the Law School are welcome to join. The Black Law Students Association (BLSA) promotes fellowship and community among all students at the University of Washington School of Law. The organization provides a forum for students to express their needs and concerns and seeks to increase diversity in law schools and the legal community at large. BLSA also strives to open and strengthen lines of communication between Black Law Students and the larger legal community. Activities include an annual barbecue, an alumni-student mentorship program, academic seminars providing tutoring and outlines for members, development of a scholarship fund, and community activities. CALSA's purpose is to organize, support, and promote the concerns of Chinese Americans in the legal profession; foster an understanding of the current issues pertinent to the Chinese community, and raise awareness of law and policy issues affecting China. DLA is an organization of students with and without disabilities working to raise awareness, foster dialogue, and support advocacy concerning disability law issues; to create an accessible and inclusive environment at the Law School; and to encourage and enhance career opportunities in the field of disability law. Please see our webpage for more information! The Japanese American Law Students Association (JALSA) gives voice to the concerns of Japanese law students and lawyers, as well as provides a forum for discussing legal issues that impact Japan and Asia at large. To that end, JALSA aims to: (1) organize, support, and promote the concerns of Japanese law students and legal professionals; (2) increase diversity and awareness in the law school and legal profession; and (3) promote interest in and encourage discussion of legal and policy issues in Japan. The mission of the Jewish Law Students Association (JLSA) is to celebrate the tradition of lawyering as a form of Tikkun Olam (repairing the world). The JLSA is designed to meet the needs of the Jewish student body within the University of Washington School of Law. Our organization includes secular as well as observant students, and all of our events are open to the entire law school community. Activities include social events, monthly “Lox ‘n Learn” with Rabbi Oren on Jewish/legal topics, and events celebrating Jewish holidays. We are also affiliated with UW’s Hillel community. KALSA at UW was started in 2005 by registered University of Washington Law School students with the goal of serving the Korean-American and the greater Seattle community through various community service and scholarly efforts. KALSA members work closely with the Korean-American Bar Association, Korean Community Counseling Center, and other community groups to further KALSA goals. Our purpose is to create a support a network and community for Latina/o students at UW, promote higher education, and to provide mentorship for youth interested in law and newly admitted students. We are also committed to promoting minority and social justice issues at the law school, as well as in the legal profession and the community at large. Latino/Latina Law Students Association sponsors outreach programs, motivational speaking engagements, area and intra-state school visits, an annual Cinco de Mayo Celebration, and other events aimed at educating and creating awareness of issues affecting our communities. This organization is open to everyone. LSSSC provides programs of interest, networking opportunities, mentoring, and social support for students who have spent some time in the work force, raising a family, or pursuing other interests prior to attending law school. LSSSC works with the UWLS and UW administrations to improve services and opportunities for these law students. Generally, these students enter law school at a later than average age, have been employed in the past, or have other experiences that may enrich and inform their law school experience. MESALSA strives to create a sense of community among student of Middle Eastern and South Asian heritage, as well as students interested in the Middle East and South Asia. MESALSA creates an opportunity to connect with Middle Eastern and South Asian political and legal professionals, as well as other Middle Eastern and South Asian professionals, in the Greater Seattle Area through events and programs. We are committed to promoting the success of our Middle Eastern and South Asian law students in their professional careers, as well as promoting awareness of issues facing our communities through events and discussion. MESALSA recognizes and appreciates that the Middle East and South Asia are diverse and distinct regions, but we also choose to recognize and appreciate the similar and unique issues both communities face, and celebrate its presences in the Pacific Northwest. The Minority Law Student Association is for systemically marginalized students of this institution looking for a space to build community, question power, and further the goals of social justice. MLSA intentionally reclaims space for students of color, queer folks, people with disabilities, and other students from backgrounds that have been marginalized and continue to struggle with access to legal institutions and justice. MLSA offers solidarity with students who may not identify closely with traditional law school trajectories, and seeks to create a place of community for those doing similar work. In addition to other affinity groups, MLSA is a space for minorities built on the mission to center and amplify their voices and experiences. The Native American Law Students Association (NALSA) was founded in 1970 to support Native American students at the University of Washington School of Law, and to promote the study of Indian law in order to serve tribes and tribal communities with commitment and excellence. The purpose of Outlaws is to provide a social and support network for lesbian, gay, bisexual and transgender (LGBT) law students at the University of Washington (UW) School of Law; to raise awareness of LGBT legal issues within the student body and faculty; and to provide mentoring to law students by sponsoring on-campus speakers, discussion panels, and advocacy activities. PALS aims to create a social network, support group, and student organization for students who have or are considering having children, as well as raising awareness in the law school community about work-family and parenting-related issues. We strive to create an environment in which students and their children can grow and learn together. This year we will sponsor fun events for children and their parents, provide a casual forum for networking about shared parenting experiences, and work to focus attention on the particular issues affecting parents in law school and beyond. The Law Women’s Caucus is dedicated to raising awareness about women in law—both as professionals in the field and as subjects of the law. We provide support to law students through mentorship programs, informational workshops, networking and service opportunities, and educational and social events. MCHB furthers excellence in oral and writing advocacy at the University of Washington School of Law. We sponsor five in-house competitions throughout the year including mock trial, contract negotiation, and appellate advocacy competitions. MCHB also works to promote and sponsor teams that compete in regional and national moot court competitions across the country on behalf of the University of Washington School of Law. Sixteen first-year students are selected at the end of each year based upon performance in 1L Mock Trial, performance in 1L Appellate Advocacy, cumulative performance during all in-house competitions, and performance in regional and national moot court and mock trial competitions. Second-year students are selected throughout the school year based upon superior performance during in-house competitions. The Washington International Law Journal was founded in 1990 [orginally Pacific Rim Journal] as an innovative vehicle for the discussion of legal and interdisciplinary policy-oriented issues affecting both Asian and trans-Pacific affairs. The Journal's function is three-fold. First, the Journal provides valuable writing and editing experience to University of Washington law students interested in Pacific Rim law and policy issues. Second, the Journal, as one of the only two student-edited law journals in the United States devoted to the Pacific Basin, and the only journal featuring translations of East Asian legal scholarship, encourages the debate of issues vital to the Pacific Rim. Third, the Journal enhances the University of Washington School of Law's national and international role as a center for East Asian legal studies. Membership is competitive and based upon first year grades and writing competition scores. The Washington Journal of Environmental Law & Policy publishes legal scholarship on environmental affairs important to the Pacific Northwest region and beyond. By drawing expertise from across the disciplines, the Journal promotes the investigation of current environmental law and proposed solutions for the future. The Washington Journal of Law, Technology & Arts publishes concise legal analysis for practicing attorneys. The Journal collaborates with the Law, Technology & Arts Group (LTA), a new research program at the University of Washington School of Law. LTA was formed in 2009 when the University of Washington School of Law merged the Center for Advanced Study & Research on Intellectual Property (CASRIP), the Shidler Center for Law, Commerce + Technology, and the Graduate Program in IP Law & Policy into a single research unit. This new research group takes a comprehensive approach to the legal issues involving technological and artistic innovation. The Journal, which was launched in 2003, publishes in an electronic format and addresses business law and technology issues in a global context. The Journal's concise online format ensures each issue contains cutting-edge analysis of legal of emerging issues in business and technology. The Journal is a partnership between student editors and an Editorial Board comprised of faculty and attorneys who are noted experts in their respective fields. Membership is competitive and based upon first-year grades and performance in a writing competition. Established in 1919, Washington Law Review is Washington State's flagship legal publication. Washington Law Review publishes four issues each year and regularly posts online features. It also hosts an annual symposium on a timely and relevant issue of law; facilitates conversations with visiting legal scholars; and provides opportunities for University of Washington School of Law students to publish scholarship and contribute their original research to the larger legal conversation. The Immigrant Families Advocacy Project (IFAP) assists immigrant victims of family violence as they petition for permanent residency in the United States. The organization works closely with the Northwest Immigrant Rights Project and pro bono attorneys from the community. Students gain valuable real-life legal experience working directly with clients and attorneys. Foreign language skills or immigration or domestic violence backgrounds are a plus. The Incarcerated Mothers Advocacy Project (IMAP) is a coalition of law students, attorneys, social service providers, and formerly incarcerated women who seek to change the rights afforded incarcerated and previously incarcerated women in Washington. IMAP supports incarcerated women by providing legal information on family law and dependency issues, and by connecting parents to outside resources. IMAP offers monthly prison presentations at Mission Creek Corrections Center for Women, and monthly presentations and office hours at Washington Corrections Center for Women. IMAP also works to connect community providers, such as parent, chemical dependency, and domestic violence advocates and experts to incarcerated women by hosting a series of classes and trainings at our prison sites. Street Youth Legal Advocates of Washington (UW-SYLAW) is dedicated to addressing the legal needs of at-risk and homeless youth in Seattle. Working in conjunction with TeamChild, UW-SYLAW volunteers assist those affected by the legal ramifications of homelessness at a young age, running a juvenile records sealing clinic under the supervision of TeamChild attorneys. Further, UW-SYLAW works with area shelters and civil aid attorneys in efforts to protect homeless youth rights through presentations, fliers, and other forms of education. The Association for Student Defenders and Prosecutors ("ASDP") at the University of Washington School of Law was founded to support law students focused on careers in criminal law. To this end, the ASDP works with individuals and agencies in the Washington criminal law community to provide educational, skills-based, and networking events that will develop students' perspectives, competencies, and professionalism in the criminal law practice. The mission of the ASDP is to improve the quality of criminal justice in Washington State and is committed to bringing together students and practitioners from all areas of criminal law. The Center for Human Rights and Justice (CHRJ) exists to train University of Washington School of Law students in human rights law and to educate the community in human rights issues. We realize this goal by hosting speakers, symposia, and events on a wide variety of human rights topics. We coordinate human rights projects with area practitioners, lobby for a strong human rights curriculum, and fund student work in human rights through Public Interest Law Association (PILA) grants. Currently, we are partnered with the Northwest Immigrant Rights Project (NWIRP) to assist asylum applicants through our Asylum Application Assistance Project. We also serve the UW Law community through our used bookstore located in Gates 137. We are a registered 501(c)(3) not-for-profit organization. CLS aims to build a community of Christians at law school and in the legal profession in Seattle. The group provides opportunities for discussion, volunteering, mentoring, and networking. The Education Law and Policy Society is a group of students with a passion for education and the law who seek to understand and educate others on the intersections between education issues, equity issues, youth justice issues, and the law. Our organization hosts several lunch time meetings with guests and speakers, hosts the Forces of Change Education Equity Conference, puts together the Education Law and Policy publication, and is developing a pro bono project. The purposes of the Education Law and Policy Society are: (1) to educate the student body as to the role law and lawyers play in shaping public education; (2) to connect UW law students interested in school law with practicing attorneys in the field; and (3) to impact the development and implementation of education law through research, dialogue, and community service. "The Environmental Law Society is an organization that promotes student involvement in environmental law through education, community involvement, and hands-on experience. Our annual pro bono project provides a wonderful opportunity for law students to gain practical legal experience; the last two years have featured projects relating to climate change. We also host several educational events each year, from career panels to expert discussions on current environmental issues. Additionally, we provide networking opportunities with local environmental attorneys, help students with environmental course planning, and organize outdoor events—both educational and recreational. ELS prides itself on flexibility and encourages members to propose new events in an effort to seize opportunities as they present themselves. The primary goal of the International Law Society ("ILS") is to give law students the resources, knowledge, and practical tools needed to successfully navigate issues relating to international law – a subject both complex, and increasingly important to all legal practices. To achieve this goal, ILS is actively focused on creating externship opportunities, hosting student language groups, building connections with international law associations such as the international section of the ABA and WSBA, and bringing speakers to campus to discuss a wide range of international topics. The Law & Business Association seeks to educate students about opportunities in the intersection of business and law by engaging law students with practitioners, faculty, and other students across the University. LBA’s goal is to provide a forum for students to develop diverse and practical skills necessary for a successful legal career. LADR prepares future lawyers to effectively represent their clients in alternative dispute resolution (ADR) processes (including negotiation, mediation, and arbitration), which they may frequently encounter prior to litigation in resolving client disputes. Today, over 90% of law suits never make it to trial, making ADR skills not only beneficial but necessary for competent lawyering in any practice area. LADR offers educational and networking opportunities, and participates in the ABA National Representation in Mediation Moot Court Competition. 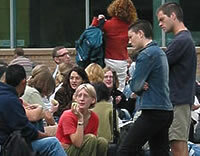 While LADR is an organization run by students, its membership is open to faculty, alumni, and community members interested in promoting appropriate dispute resolution practices. An organization composed of individuals who have some connection to the Armed Forces of the United States. Designed to help transition individual from the military to law school and help those who wish to become military lawyers adjust to military life, by focusing on the social and community aspects of both the military and law school. The National Security Law Association is an organization devoted to fostering awareness of national security-related issues in the law. NSLA strives to create an effective, non-partisan forum for informed discourse on U.S. national security policy and foreign affairs. The NSLA offers a great opportunity to meet and connect with other law students interested in national security law and professionals already working in the field. We are the preeminent law fraternity promoting the bonds of fraternalism, and we are the leader in the development and advancement of professional ideals. The Public Interest Law Association at the University of Washington is a 501(c)(3) non-profit, student-run organization dedicated to promoting legal work that serves the public, alleviates suffering, and improves the quality of life for individuals in our community and elsewhere. To this end, PILA raises awareness about the need for and rewards of pro bono and full-time public interest legal work, advocates for public interest training and creates opportunities for law students and attorneys to combine their legal skills with passion and optimism in jobs that exemplify lawyers' capacity to make a difference. PILA is one of the largest and most active student organizations at the UW School of Law. Through an annual benefit auction and other activities, PILA funds summer grants for law students, the creation of a loan repayment assistance program, and educational and networking opportunities for students to generate enthusiasm for public interest law and encourage law students to serve others and make a difference. The Sports and Entertainment Law (SELA) Club was founded to explore the rapidly growing and lucrative fields of sports and entertainment law. We invite prominent attorneys, agents, and business persons to speak to the group regarding when, why and how they entered these fascinating fields. SELA seeks to encourage students to consider sports and entertainment law as a career path by fostering awareness in these areas through sports outings, fundraisers, and other entertaining events. Join us and explore the frequently high profile and always exciting fields of sports and entertainment law! The Student Bar Association (SBA) is the governing body for all University of Washington law students and student organizations. Students for Labor and Employment Justice (SLEJ) is a law student organization based at the University of Washington School of Law. Focused primarily on workers' rights issues, we strive to bring issues forward that are relevant to workers and employers alike. Labor and employment intersects with many different areas of law and is a field with a small community of passionate and dedicated lawyers that we help students connect and network with. Moreover, we work hand in hand with the Unemployment Law Project, a non-profit legal firm and a member of the Alliance for Equal Justice. The Forum for Evidence-Based Law & Policy (FELP) was created in Fall 2010 to provide a forum for law and graduate students to discuss how science and other empirical fields can improve law and policy-making. We want to be part of a growing intellectual movement that emphasizes scientific behavioral models in law and policy. Our organization provides a place for students to keep abreast of the current state of the field through a reading group and through lectures from current practitioners. We believe that the knowledge that we obtain as members of FELP can help us contribute to social justice and to the reduction in inequality in the United States and globally.